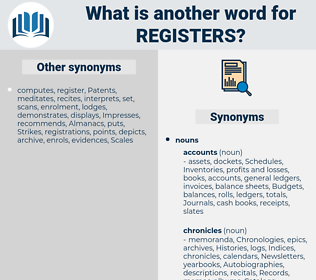 What is another word for registers? 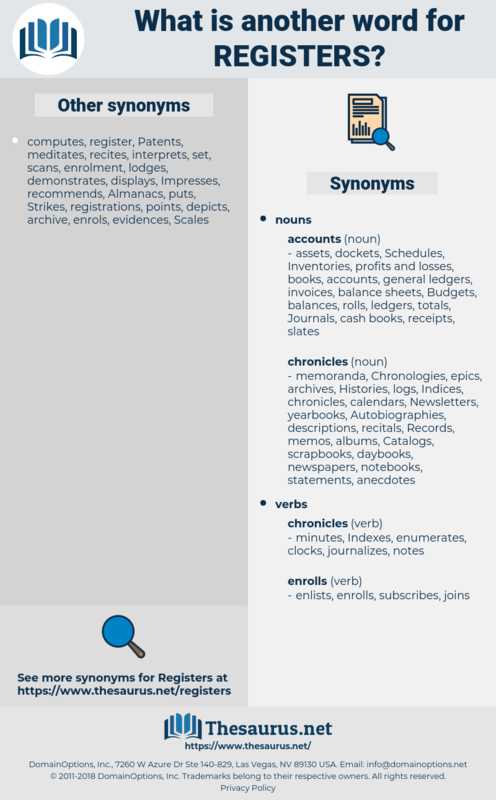 registros, statistics, electors, lords, accounts, indicateurs, contaminants, logs. indicateurs, markers, friendly, persistent, attainment, cleaner, sets, Polluting, emissions, touch, PSR, bookings, degree, contaminant, contaminants, hits, HIT, extent, seen, clock, air, level, menus, open, urban, pollution, sees, rope, inch, POPS, registrar, registrars, registre, registro, log, logs. registrants, authorities, sorting, repositories, requirements, listings, list, lists, subscribers, dossiers, classification, Classifications, stores, repertoires, rosters, archives, Databases, ledgers, checklists, papers, Insurances, Measurements, rankings, recorders, scores, Filings, folders, scanning, loggers, ratings, repertories, catalogues, caisses, provisions, procedures, deeds, sections, dampers, collections, checks, slates, polluants, sources, Censuses, Histories, sheets, livres, systems, ties, coffers, logbooks, protocols, Schedules, fascicles, Indexes, displays, acts, aspects, crates, rolls, electors, TAPES, banks, capture, data, documents, notebooks, sorts, Publications, Ships, raids, Journals, cadastres, substances, transcripts, compilations, Copies, figures, Gases, vessels, Brochures, drums, images, Maps, chemicals, Forms, points, Fees, charts, workbooks, benchmarks, dockets, Textbooks, volumes, tabs, tuitions, plates, cartons, Roles, offices, fits, Patients, Booklets, pools, pinks, only, Los, LBS, approaches, Boxes, funds, unions, bills, cases, albums, accounts, Parties, cars, panels, pounds, compounds, indicateurs, markers, Polluting, emissions, bookings, contaminants, hits, menus, POPS, registrars, logs. exists, represents, enters, writes, incorporates, subscribes, suggests, recognizes, suffers, discovers, identifies, receives, enshrines, reflects, submits, responds, asserts, certifies, presents, Addresses, corresponds, articulates, encounters, acknowledges, enrols, indicates, relates, contributes, expresses, remembers, belongs, notes, confirms, chronicles, arises, detects, experiences, declares, includes, lists, constitutes, Tracks, incurs, advises, emerges, dovetails, appears, reaches, speaks, operates, stores, stems, approves, moves, argues, seals, captures, undertakes, enjoys, performs, complements, conforms, conveys, monitors, lies, follows, Comes, embodies, marks, occurs, says, produces, draws, complies, adds, opens, is, Faces, feeds, aligns, counts, senses, shows, proceeds, takes, holds, Rests, continues, goes, gets, lags, closes, falls, ties, keeps, Has, puts, conducts, builds, extends, runs, Forms, fits, registrations, makes, accounts, sets, contaminants, hits, sees, logs. registry, Registries, registration, registrations, record, Records, recording. inserts, enrolments, registrations, recording, recordings. enrolls, inserts, maintains, registration, record, Records, recording. You have seen Mr. Auriol's contract, given to the secretary of the Company by Mr. Hastings in order that he might have the whole records and registers of the Company under his control. So we entered into a compromise; Miss Baby was named Anne Barbara, with an understanding that the first name is to be for use, and the last for the registers. rector, registry, registrar, roisterer, Rest-harrow, rochester, restore, resuscitator, restharrow, Requester, reciter, Rose water, reactor, resistor, raster, rosewood tree, rock star, roaster, rester, roister, racketeer, rough-dry, roster, rough water, rest area, rush aster, rocketry, resister, rooster, rectory, restorer, residuary.